Hatetweetsoffrankocean.com lets you respond to homophobic Twitter bigots with a message of love. 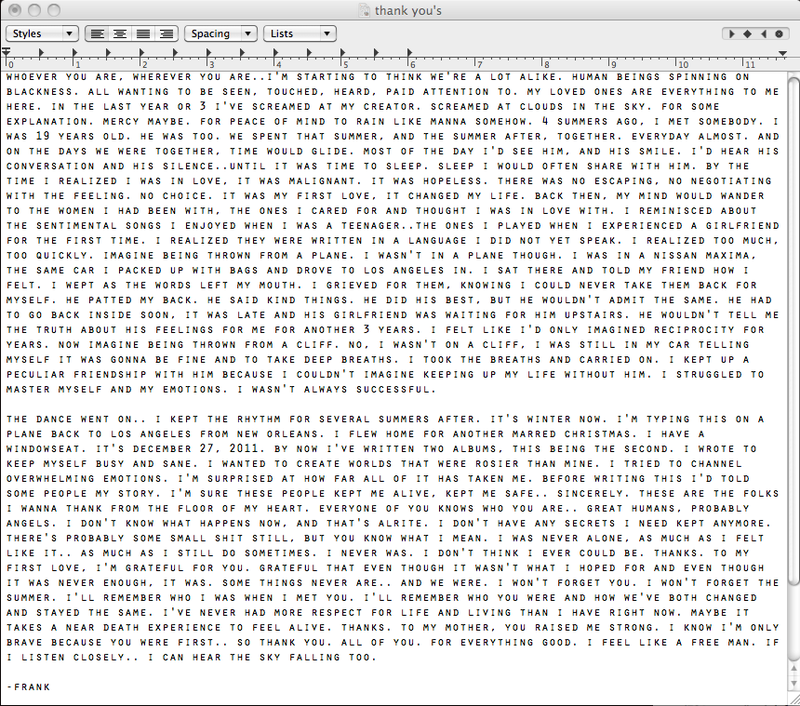 Last week, 2011 breakout star Frank Ocean posted a grainy screengrab of the liner notes to his new album, Channel Orange, on Tumblr. In the “thank you’s” section, he described falling in love with a man, and the heart-wrenching experience of being rejected. His story wasn’t really about sexuality so much as love–falling into it, accepting it, and requiting it. Those subtleties didn’t seem to matter on Twitter, where the 24-year-old was barraged with homophobic slurs and hateful messages–despite statements of support from Beyonce, Russell Simmons, and even Ocean’s (arguably homophobic) Odd Future bandmate Tyler the Creator. Weirdly, the media portrayed Ocean’s story as a triumph for an industry where homosexuality is taboo. But a cursory look at Twitter told another, uglier story. It took the team less than a day to develop and launch Hate Tweets of Frank Ocean, which went live yesterday. The site collects dozens of homophobic Tweets, framing them above a pink heart-shaped button that generates an @reply to each individual message. The auto response? “It’s not who you love – it’s *that* you love that truly matters.” The group hopes they’ll show online bigots that “this kind of behavior just isn’t acceptable,” explains Åström, who says the response has been “inspiring.” Yep–the livestream of responses is pretty wonderful. We habitually think of the Internet as humanity at its worst. But that’s reductive. Sure, the web has made cyberbullying easier, but it’s also enabled some pretty amazing ways to troll cyberbullies (here’s another example from this week). “I used to love the Internet,” Åström writes on his personal Tumblr. “But right now our relationship is in a constant state of crisis.” Chalk this one up as a win. Head over to the site to send some warm, trollish love.